Preheat oven to 200°C. Grease a roasting pan. 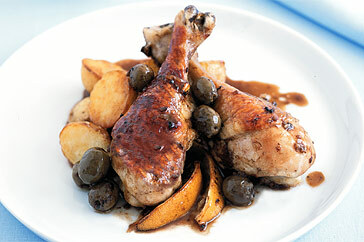 Arrange drumsticks in a single layer in pan. Top with olives. Cut 1 lemon into thin wedges and place between drumsticks. Juice remaining lemon. Combine 1/4 cup lemon juice, vinegar, oil, garlic and salt and pepper in a jug. Pour over drumsticks. Roast drumsticks for 45 to 50 minutes or until cooked through. Serve with potatoes. To freeze: Place drumsticks in a single layer in airtight containers. Freeze for up to 6 weeks. To reheat: Thaw in the fridge overnight. Microwave, covered, on MEDIUM (50%) for 3 to 5 minutes or until hot.